The X-Elite Pro is a great value sit/stand desk for those looking for an affordable way to get into the world of standing desks. Here at 9 to 5 Ergonomics, I’ve written quite a bit about the benefits of standing desks and the proper standing desk posture. Interestingly, I haven’t written much about the various standing desks available on the market. Today I am going to review the X-Elite Pro height adjustable sit/stand desk. I actually own two standing desks – the X-Elite Pro that I use at work and a Jarvis desk that I use at home and hope to review another time. The X-Elite Pro is a fantastic alternative to buying a full-on standing desk. Rather than a stand-alone product, it allows you to convert your existing desk into a sit-stand desk. 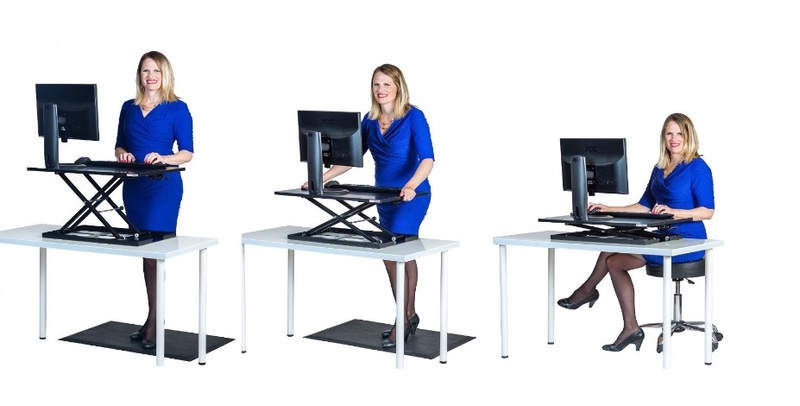 The X-Elite Pro sits on top of your existing desk and provides a platform that you can move up and down. When fully retracted, the X-Elite Pro can function as a regular sitting desk. When extended, it can be used like a standing desk. The mechanism for lifting the desk is a bit different from many other sit/stand desks that I’ve seen on the market. Rather than lifting with a motor or a crank, with the X-Elite Pro you just press a latch on the front of the desk and lift. A hydraulic system will maintain the height of the desk when you release the latch, similar to the way that you can raise and lower the height of many office chairs. In practice, that means that the X-Elite Pro is somewhat limited in the amount of weight that it can support. At the very minimum, you must be able to lift some portion of the weight of the desk in order to raise it. The X-Elite Pro is rated to support 20 lbs. by the manufacturer, which is enough for a monitor and keyboard, but not much else. The platform itself is actually relatively large at 20″ x 28″. However, I would not recommend putting your monitor speakers and a Thunderbolt monitor on the X-Elite Pro. They won’t fit. Even if you do manage to squeeze them in, the weight will make the X-Elite Pro feel wobbly. In terms of height range, the X-Elite Pro will fit most individuals shorter than about 6′. If you are taller than 6′ (a I am), you may need to get a bit creative with how you set up your peripherals and monitor. Personally, I use a stack of paper and monitor stand, which works find, if a bit of hack. According to X-Elite, the height range while standing is from 7 to 16 inches, and is 2.5 inches while fully retracted. The 7 to 16 inches range should be fine for most people. Strangely, it’s actually the 2.5 inches while retracted that can be a bit frustrating. Many other sit/stand desks have a separate tray for a keyboard and mouse. As a result, this tray sits flush with your desk when the platform is retracted. In addition, you can use the platform as a pseudo-monitor stand in order to elevate the monitor above the same level as the keyboard and mouse. With the X-Elite, this isn’t an option, and using the platform at a height of 2.5 inches above your desk can be awkward. As a result, you will likely need to move your keyboard and mouse off the platform when using it as a sitting desk. It’s not a huge deal, but it’s an unnecessary step. Large Platform – The 20″ x 28″ platform is big enough to fit all the necessities. Easy To Use – The mechanism for raising and lowering the platform is as simple as can be. Fantastic Bargain – An entry point into the sit/stand world at a reasonable price. Sturdiness – As a sit/stand platform, rather than a true sit/stand desk, the X-Elite Pro just isn’t as stable as my Jarvis Desk. Height Range – The 7-16″ adjustible standing height will work for most folks, but the 2.5″ retracted height can be awkward. In reality, the X-Elite is a fantastic bargain for what it does. It’s an entry point into the standing desk world and gets the job done for the fraction of the cost of a full stand-alone standing desk. With that said, it does not get you all the way there, particularly when it comes to sturdiness. However, at the price point, it is among the best in its segment. Final Verdict: A fantastic entry-level sit/stand platform for those looking for a standing desk at a reasonable price.